With the help of the Londonderry Township Historical Committee, Street Road organized this exhibition about the history of our roughly 7000-acre township in Southern Chester County, Pennsylvania. A participatory work, the project centers on the collection of memorabilia and artifacts. All township residents were invited to contribute items. Their personal stories and items were displayed alongside a broader history taking in sites such as the Daleville Store, St. Malachi’s Catholic Church, and Derry Meeting, as well as European settlement, pre-colonialism First Nations (in particular the Leni Lenape), and earlier, pre-human settlement. The project is conscious of its own title as an arbitrary and problematic but nonetheless evocative organizing principal. Items were displayed in a traditional installation, where visitors can view them in a physical setting; but are also reiterated online, at @7000acres, where the collection will have a longer duration, and where anyone who connects to a particular artifact can comment, respond, like or link to it, and can add their own hashtags, actions that parallel those of the traditional archivist. The project thus proposes social media as an explicitly non-objective and self-consciously collaborative alternative to traditional archival methods, and as a unique tool for expanding the definition and influence of community and regional identity in the 21st century. A continually evolving platform, social media's contemporary popularity and global reach contrasts with simplified definitions of regional identity, prompting fresh engagement and reflection. As a multilayered exhibition 7000 Acres aims to provoke dialogue around our understandings of the idea of community and to consider evolving concepts of place and its impact on individual identity today. From Breou’s Farm Atlas of Chester County. 1883. We are collecting materials up to and throughout the exhibition. 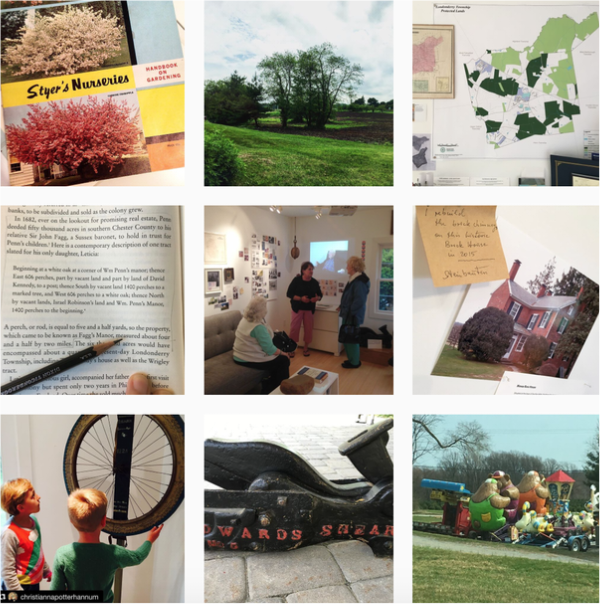 Please get in touch at info@streetroad.org and on @7000acres on Instagram - to share stories, photos, maps, your own work, etc. Any connection to Londonderry Township, Chester County PA is reason enough to get in touch. You can also get in touch by emailing Diane Henryson, chair of the Londonderry Historical Committee. Visit Londonderry Township's history page here. Thank you to the Chester County Historical Society for supporting this project.